I haven't read Half Bad yet, but I had heard a lot of things about it and let me put it this way, they were half good - sorry, I couldn't resist it. Many mixed feelings got me wondering, do I want to start reading yet another series. But then I saw Half Lies on Netgalley and it felt like a great way to get a preview of the series. I didn't understood too much of the story, which is of course entirely my own fault. I take all the blame for not understanding the differences between the White and Black witches and why exactly they hate each other so much. Written as if Michele's diary it's a record of her new life in Florida together with her brother Gabriel and her father. The story took a dark road near the end. One thing I know for sure after reading Half Lies, I want to read Half Bad to try and figure out everything. This is a prequel for the series, but I wouldn't recommend reading this one before Half Bad because I think you'll end up like me, left with a lot of questions. 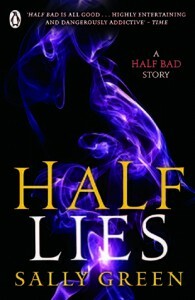 Half Lies is the prequel to the Half Bad Trilogy. The first book is Half Bad and the second book, Half Wild, is expected to be published in March.